The 31st Mississippi Valley Blues Festival returned to its roots and as part of that return, showcased the mighty musical talent found right here in the Quad Cities. The inaugural Local Scene Stage was a tremendous hit, so the Mississippi Valley Blues Society is pleased to announce the return of the Local Scene Stage to the 32nd Mississippi Valley Blues Festival. Local talent will be presented between Bandshell stage sets. In some cases, entire bands are represented. Some of those bands have formed for this event. Welcome to the 32nd Mississippi Valley Blues Festival! The Mississippi Valley Blues Society, which organizes an all-volunteer award-winning festival, will kick off its 32nd Annual Blues Fest with the National Anthem on Friday, June 30 at 4:50pm. The 2-day festival will be held at its traditional location in LeClaire Park, Davenport, IA. Tickets can be purchased at the festival gate (Ripley Street & Beiderbecke Drive) for $15 on Friday and $20 on Saturday, July 1. Kids 14 and under are free with a paid adult. Music begins on the Local Scene stage at the same time gates open. Read more about Welcome to the 32nd Mississippi Valley Blues Festival! The Zach Harris band won the 2015 preliminary round of the Iowa Blues Challenge, and took 2nd place at the final round in Des Moines, Iowa. They play with a solid fury of blues that you would expect from a long standing, hard working group that has been heavily influenced by Chicago and Texas blues, as well as old school Mississippi delta blues. All Sweat Productions is a new, live music project brought to you by QC musicians, Al Sweet & Bret Dale (The Candymakers). Al & Bret’s idea is to gather the most talented musicians from the QC area to pay tribute by performing some of the best Rock n' Roll moments known to man! Southern Indiana-bred singer-guitarist Reverend Peyton is the bigger-than-life frontman of Reverend Peyton’s Big Damn Band. He has earned a reputation as both a singularly compelling performer and a persuasive evangelist for the rootsy country blues styles that captured his imagination early in life and inspired him and his band to make pilgrimages to Clarksdale, Mississippi to study under such blues masters as T-Model Ford, Robert Belfour and David “Honeyboy” Edwards. Joanna’s original hometown of Worcester Massachusetts isn’t known to be a blues hotbed, but Joanna started out in the blues at a young age, seeing any blues band that would come to town. By her mid teens, she was playing the Worcester and Boston clubs with her own band, before moving to Chicago in 1984. Blues aficionado. That’s how one would describe Travis Ried, who grew up in West Burlington, Iowa. Having discovered the blues during his high school years, Travis has been playing, studying, and breathing the blues for 25 years! 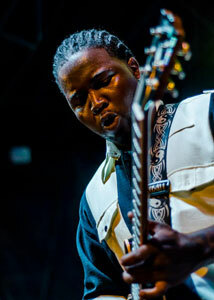 Marquise Knox was born in St. louis, Missouri, where he grew up in a musical family deeply rooted in the blues. He learned how to play the guitar from his grandmother Lillie, and also played with his uncle Clifford, who was a major influence in his life. 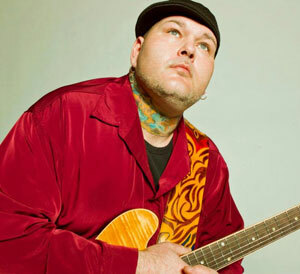 Formed in 2013, The Corey Dennison Band has become a favorite at Chicago blues venues, including twice weekly shows at Kingston Mines. Led by Corey’s soulful voice and muscular guitar, the band has released 2 cd’s, 2013’s “Live in Chicago”, and their self titled debut, “Corey Dennison Band”, in 2016 on Delmark Records. Hamilton Loomis was born and raised in Galveston, Texas, by parents who were also musicians. Music ran in his veins, and he played drums, piano, guitar, and harmonica. He performed in his family’s doo-wop group. A protégé of Bo Diddley, Hamilton met the music icon backstage at Houston’s famed Rockefeller’s when he was 16. Before the night was over, Hamilton was onstage playing guitar with the legend. Bo has appeared on 2 of Hamilton’s cd’s and presented a red guitar to Hamilton, that he still plays. Dana has always been a singer, and has portrayed singers in theatrical productions. She played Janis Joplin in the off Broadway musical tribute to Janis Joplin titled “Love, Janis”, which closed at the Village Theater on January 5, 2003. She made her motion picture mark ten years ago as Sadie, a powerful blues singer in “Across the Universe”, Julie Taymore’s wonderfully innovative movie set in the 1960’s, featuring over 30 Beatles songs. 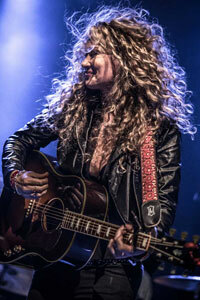 Dana sang “Helter Skelter”, “Oh Darling”, and “Don’t Let Me Down”. 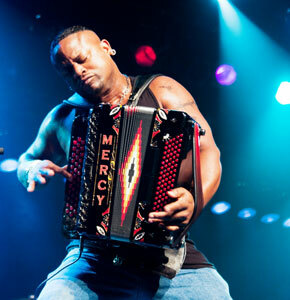 “America’s Hottest Accordion” winner, Dwayne Dopsie, plays a unique, high energy style of zydeco. He hails from one of the most influential zydeco families in the world, and although he’s inspired by tradition, he has developed his own style that defies existing stereotypes, and blazes a refreshingly distinct path for 21st century zydeco music. This singer/songwriter and accordionist has performed all over the world since debuting his band at age 19. The annual Winter Blues program features vocal and instrumental workshops (guitar, bass, harmonica, keyboards & drums), as well as concentration on blues composition and improvisation. Sessions are open to area musicians from 8-18 years old. The Winter Blues All Stars, a blues band made up of some of last year's participants – So get ready to close your eyes....sit back...and enjoy the music! This group is an 'all kids' RME band that sound (and act) like seasoned professionals. Originally from Galesburg, IL, this Tulsa OK Blues Club founder, prevention educator, and drug/alcohol counselor continually shares his enthusiasm and passion for the Blues with young people and adults. David is an endorsee for Hohner harmonicas and has taught harmonica classes through adult continuing education at Tulsa Community College for over 15 years. He also teaches children’s harmonica classes for the Tulsa Parks and Recreation Department. David’s BlueSKool session features free harmonicas and lessons for all the kids! 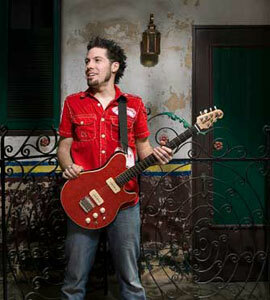 Josh Kain, also known as QC Slim, is the remarkable lead guitarist and singer of the QC Slim Blues Band. He is accompanied by the soulful bassist, John Tobin and the rhythmic drummer, Todd Vipond. 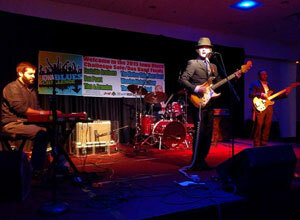 The members of the QC Slim Blues Band are from Moline, Illinois, also known as The Quad Cities. They have played in a wide variety of venues and have opened up for exceptional blues artists such as Lizzi Neal Band and Joanne Shaw Taylor. Their music is full of rhythm, soul, blues and heart and will keep you rocking and wanting more! Susan Williams and Darryl Wright have been putting together the idea of using two bass players for the last year or so. With his phenomenal ability to play the bass as a solo or lead instrument they thought it would be a unique idea to try. The couple also saw it as an opportunity to work together. So this group of musicians was formed to test out the unique configuration. In the late 1990s, singer/songwriter Phyllis Wethington released a Blues CD, co-written with Ellis Kell. 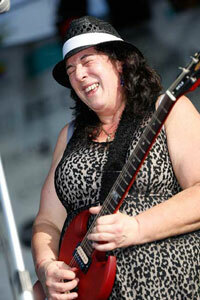 Today she returns to the blues scene and her blues band makes its Quad-Cities debut. Joining her are her husband Gary on bass, Jim Van Hyfte on drums, Joshua Kain on guitar and Detroit Larry Davidson on harmonica. The Avey Grouws Band hits hard with a soul for Blues, Rock and Americana...and an eye for fun! Jeni Grouws met Chris Avey and Bryan West at a blues jam in the Quad Cities in 2015, and later that year The Avey/Grouws Duo was formed. After throwing in a handful of well-received full band gigs in 2016, in 2017 the duo finally called up Bryan West to officially form The Avey/Grouws Band.